Original copies include inner sleeve promoting Motown releases. Earliest pressings were on dynaflex vinyl. For those that might be interested, I acquired 3 different pressings and performed a detailed analysis of each. Those pressings are: an original (TS-310) from 1971, the much lauded Motown remaster from 1987 (2815ML), and a recent 180g remaster. TL;DR - The 1987 Motown pressing wins hands down. Tests were conducted by playing sections of the title track and 'Inner City Blues' using a pair of Martin Logans, as well as capturing high resolution waveforms so I could analyze them visually and audibly using high end Etymotic in-ear monitors. Playing them on the Martin Logans revealed subtle and not-so-subtle differences, all of which were confirmed using the in-ear monitors. The original pressing is natural and familiar, though it sounds a bit flat in comparison to the other two. The Motown remaster preserves everything that's great about the original pressing while adding subtle depth, clarity, and dimension. The 180g remaster goes in a very different direction. You can tell it suffered from the same issue that befell lots of music released in the late 90's and early 00's: compression. Comparing the visual waveforms for all 3, the original and Motown pressings have similar sonic signatures, with only the slightest hint of volume boost on the Motown pressing, presumably due to the greater dynamic range available using the technology of the day. The 180g remaster looks more like a "wall of sound" with very little visual difference between quieter and louder sections. Unsurprisingly, the 180g remaster sounds louder across the board with bass being greatly enhanced. That's not to say it's "bad" or even "inferior". Sure, purists will hate it, but I don't think that's who this release was targeting. The average consumer will think it's just peachy, though the rest of us know the real score. I'll be keeping the pressings from 1971 and 1987; the former because it's what it was meant to sound like when it was released, and the latter because it's among the best sounding versions available today. I will be back with an updated comparison if/when I get my hands on other pressings (i.e., new/old MoFi's). If anyone wants to see the waveform comparisons or wants to hear audio samples, feel free to drop me a message. MoFi just announced they're pressing this on Ultra Disc 1 step! Get em while you can, only 7,500 available for preorder. This is the only album I ever purchased that I love "EVERY" track on it. This LP is timeless as it pertains to yesterday, today, and unfortunately tomorrow. I remember once, when i was listining this record alone in my room, I cried, I cried, like the rain on the cover. Best album of the history! Before I go on with my review, I have to say that I stopped reviewing records for a while because at times I felt that I have been harsh in some of my reviews, but I had to get over myself and realize that I have very strong feelings when it comes to music. 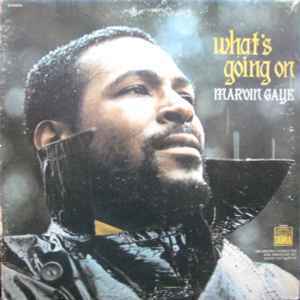 With getting that out of the way, I know that this album has been review millions of times, and even though Marvin Gaye had tons, and tons, and tons of great songs before "What's Going On", none, and I do mean none of his albums ever came close to this one! The fact that Marvin was so defiant of Berry Gordy, to go ahead with this bombshell of just great music, stuns the mind. We all know the story: Marvin was tired of being a pretty boy (just like Stevie Wonder was), and after talking with brother about Vietnam, and the tragic death of Ms. Tammi Terrell, Marvin could not take it anymore! He had to let it out, and what better way then through music! This is beyond an album, it's a documentary! The production of the record was also stunning, having it as a complete suite was priceless. I could go on and on, but why? You all know the deal, it worth you time, your attention. Listen to Inner City Blues and then read today's news. Scary.